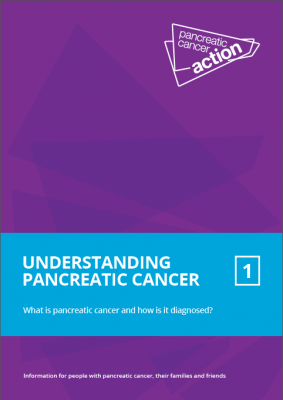 Booklet 1 – What is pancreatic cancer and how is it diagnosed? 32-page booklet for patients and carers describing pancreatic cancer, its causes and symptoms. It gives detailed information on the diagnostic tests used and the stages of pancreatic cancer. It includes a section on what to ask your doctor, where to go for further information and a glossary to explain many of the terms used. 37-page booklet for patients and carers covering surgical procedures for those who are able to have their tumour removed. Contains information on the different types of surgery available and practical information about your hospital visit and returning home. Also includes a section about second opinions, clinical trials and questions to ask your doctor and a glossary to explain some of the terms used. 37-page booklet for patients and carers covering the different procedures used to control pancreatic cancer symptoms with practical information about your hospital visit and returning home. Includes a section about second opinions, clinical trials and questions to ask your doctor and a glossary to explain some of the terms used. 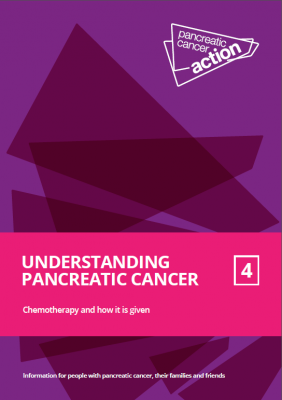 45-page booklet for patients and carers describing chemotherapy for pancreatic cancer. Describes how chemotherapy treatment works, how it is given and how it may affect the patient. Provides advice on coping with side effects. Includes a section about second opinions, clinical trials and questions to ask your doctor and a glossary to explain some of the terms used. 37 page booklet for patients and carers containing information about how pancreatic cancer can affect your diet and nutrition. Provides information on managing dietary symptoms such as poor appetite, weight loss and managing diarrhoea. Contains a section about dietary supplements and information about diabetes and diet. Contains dietary advice for patients undergoing surgery and for patients undergoing treatments such as chemotherapy. Other patient information booklets include our recipe book, eating after a duodenal stent and pancreatic cysts and cystic tumours.